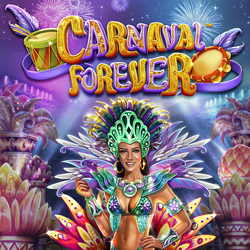 Mardi Gras season begins at Intertops Poker and Juicy Stakes Casino as they add the festive new Carnaval Forever slot from Betsoft. Until Friday, all players that have made at least one deposit can take 5 free spins on the colorful new game. From New Orleans to Rio de Janeiro, this is the season for dressing up and dancing in the streets. The new Carnaval Forever online slot game celebrates this festive spirit. Beautiful dancers in exotic costumes adorn the screen. Three or more Carnaval Queen symbols can trigger up to 9 free spins. Players eager to enjoy the ultimate thrills of carnaval can simply buy free spins. Players can win up to $250 on their free spins; 30X wagering requirement. Intertops Poker and Juicy Stakes offer a huge selection casino games from Betsoft, Worldmatch and Lucktap: slots, video poker, Blackjack, Roulette, Baccarat and Craps. They also welcome poker players from around the world to their busy online poker rooms on the Horizon Poker Network.